The Mission Beach neighborhood of San Diego is a narrow strip of land between Mission Bay Park and the Pacific Ocean, just south of the neighborhood called Pacific Beach. The neighborhood is bounded on the south by Belmont Park, an amusement park with a roller coaster and a swimming pool. Down the middle of the strip runs Mission Boulevard, a commercial area. On either side are residential areas that serve both vacationing and local beach-lovers. 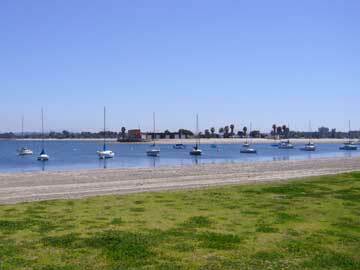 This walking tour follows Bayside Walk, a paved walkway along the west shoreline of Mission Bay. It returns by way of a paved walkway beside the wide sand beach along the Pacific Ocean. Distance: Two and half miles. Time: One and a half to two hours. Begin your walking tour at the corner of Pacific Beach Drive and Dawes Street. Walk a half block south on Dawes to Mission Bay. The gray wood building on your left is the ZLAC Rowing Club. The unusual name comes from the initials of the four women who founded the club in 1892: Zulette, Lena, Agnes, and Caroline. Turn right, and walk across the footbridge. As you walk, you first pass homes, then the Catamaran Hotel. Past the Catamaran, you again come to bayside homes. On your left are the beach and bay. On your right the shore is lined with a mixture of old cottages and new apartments and condominiums, although the cottages are becoming increasingly rare. 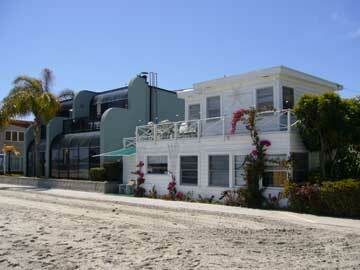 A large percentage of the bay-front residences are vacation rentals. This section of the bay accommodates both sailboats and waterskiers, so you will probably see a number of boats in the water, as well as some boats pulled up along the beach. One of the charms of walking in this area is to see the homes on some of the two dozen or so "courts" that connect Bayside Walk to Mission Boulevard. Take a few minutes at least to peek down, and preferably stroll a few yards down, several of these courts. Part way along, Bayside Walk crosses Santa Clara Place, which leads to Santa Clara Point. In case you'd like to go out on the bay, there are shops on Santa Clara Point that offer motorboat and sailboat rentals, along with sailing, waterskiing, and windsurfing lessons. 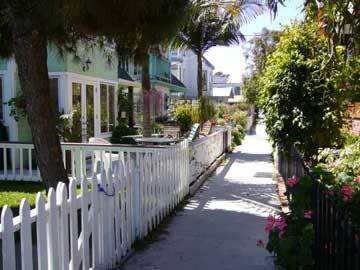 Continuing on Bayside Walk, the next small street you cross, El Carmel Place, leads out to the Mission Bay Yacht Club. Follow Island Court to Mission Boulevard. Walk left, up to West Mission Bay Drive, in order to cross busy Mission Boulevard at a pedestrian crosswalk. Across the street you will see the roller coaster of the Belmont Park amusement center. Walk out to the wide sand beach bordering the Pacific Ocean. To the south you can see the 2000-foot Ocean Beach Fishing Pier. To the north you can see the shoreline of La Jolla. 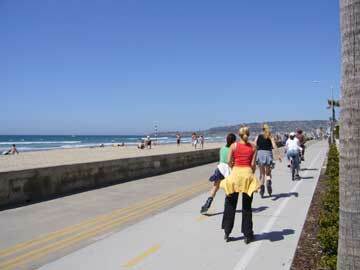 Walk toward La Jolla, either along the beach or along the concrete walkway, Ocean Front Walk. Cottages, apartments, and condominiums face the ocean. Again, you'll notice that a large percentage are vacation rentals. This route is popular with bicyclists, joggers, and skaters as well as pedestrians, so keep to the right and give the others enough room. Turn right on Zanzibar Court. (The court names are approximately alphabetical, so you will find Zanzibar immediately after York.) 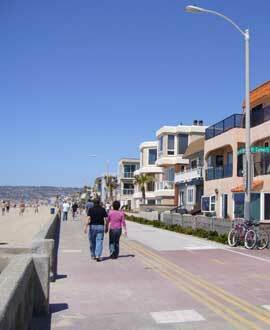 The walkway brings you out to Mission Boulevard, just across from the Catamaran Hotel. Turn left, and soon you will be at the intersection of Mission Boulevard and Pacific Beach Drive. Cross Mission Boulevard, and walk a few blocks down Pacific Beach Drive, back to your starting point.